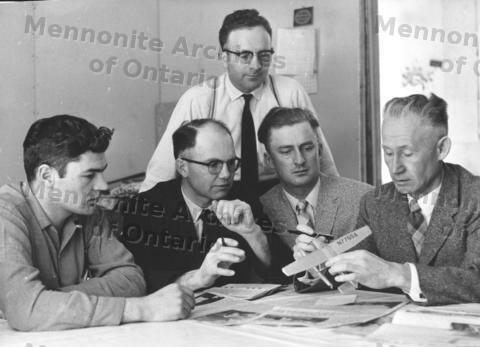 Five men examine model airplane labelled N7765A; one of the types of airplane needed in their work? L.to R.: Henry Neufeld, Otto Hamm, Ed C. Brandt, John N. Braun, H.J. Gerbrandt. Taken at MPM workers meeting, cf. See 14.4257. Negative for photo and 2 additional similar poses. Two additional negs with all 7 men (all of whom are in 1992-14.4257) and the model airplane.